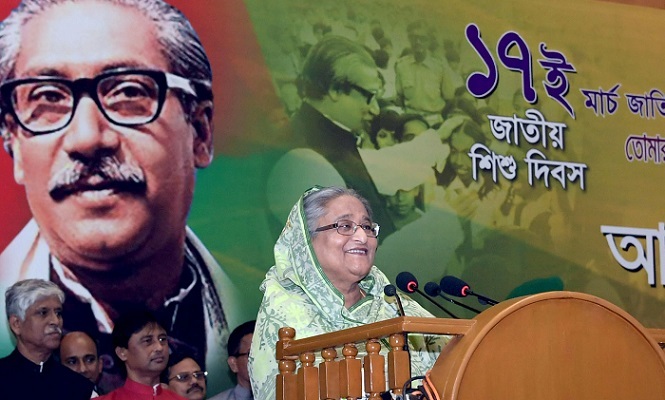 Prime Minister Sheikh Hasina on Monday said that the father of the nation Bangabandhu Sheikh Mujibur Rahman wanted to bring a revolutionary change in the election system so that none can spend additional money and carry out campaign personally. The premier came up with this observation while addressing a discussion meeting at Bangabandhu International Conference Centre in the capital this afternoon. “By creating a national unity, he wanted to introduce such an election system so that none can spend additional money and carry out campaign personally,” she said. Sheikh Hasina, also the Awami League (AL) president, was presiding over the discussion meeting. Bangladesh Awami League organised the discussion on the occasion of the 99th birth anniversary of Father of the Nation Bangabandhu Sheikh Mujibur Rahman and the National Children’s Day. Mentioning that when the Father of the Nation was rebuilding the war-ravaged nation and taking it to the path of economic freedom, then terrorism, militancy and division among the freedom fighters were created to thwart Bangladesh’s advancement, Bangabandhu then called for a national unity saying that economic emancipation is most important for the people. “He created a platform with the people irrespective of parties and opinions to achieve the goal,” she said. Sheikh Hasina said Bangabandhu wanted to introduce a new election system to ensure that the polls are not controlled by the money and sticks and the people posses the voting rights. “I believe that the people of the country will realise gradually that how much the thinking of Bangabandhu about election was suitable for Bangladesh,” she added. If Bangabandhu been allowed to make the system effective, she added, the question about fair elections would have not been raised and bloodbath and killing have not been taken place centering the election. The prime minister said military dictator Ziaur Rahman completely destroyed the politics of voting. “After grabbing power illegally and violating constitution, he staged so called ‘yes-no’ vote and presidential elections to legalise his power,” she said, adding this practice continued in Bangladesh for a long. Sheikh Hasina urged the countrymen to stay alert so the anti-liberation forces, killers, terrorists and militants never come to power.